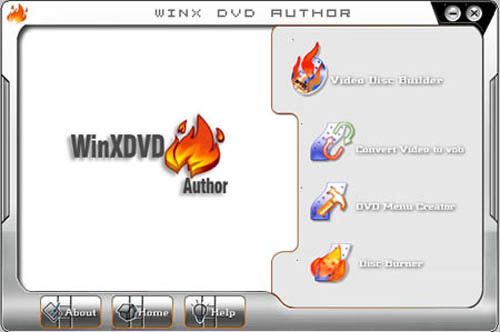 WinX DVD Author Tools was designed to convert and burn Avi Wmv DivX Mpeg Xvid RM RMVB Asf files to DVD with chapter Menu, WinX-DVD Author is the easy way to create your DVD video disc with dvd menu. Create DVD from RM RMVB Asf Wmv Avi Divx Mpeg Vob files. WinX DVD Author Support RM Asf Wmv Avi Mpeg Divx Xvid Mov media format. Create DVD disc with DVD chapter Menu. High-Quality and fastest converting engine inside. ...... Build DVD in 60 mins. (depends on your system speeds) Batch convert all movies direct to DVD. DVD Video Disk Burner Inside! * WinX DVD Author Supports almost all video formats converted to DVD, like AVI to DVD, MP4 to DVD, MKV to DVD, M2TS to DVD, 3GP, FLV, MPEG, H.264, DivX, Xvid, WMV to DVD, etc. * Batch conversion supported- this free DVD author permits you to burn two or more videos at a time. * Fully compatible with DVD+/-R, DVD+/-RW, DVD DL+R, DVD DL+/-RW. * WinX DVD Author Support all types of burner devices in current market. * Add background music & picture with this free DVD creator. * Create DVD subtitle (*.srt) to DVD with ease. * Create DVD chapter menu and DVD menu with just one click. * Burn video and save as VOB files or DVD folder on the hard disk. Qweas is providing links to WinX DVD Author 5.5 as a courtesy, and makes no representations regarding WinX DVD Author or any other applications or any information related thereto. Any questions, complaints or claims regarding this application WinX DVD Author 5.5 must be directed to the appropriate software vendor. You may click the publisher link of WinX DVD Author on the top of this page to get more details about the vendor.